This is a beautiful series with a vintage/retro influence, based upon the ball shape and colours of the American 'Gumball Machine', mixing vibrant colours with impressed silver. 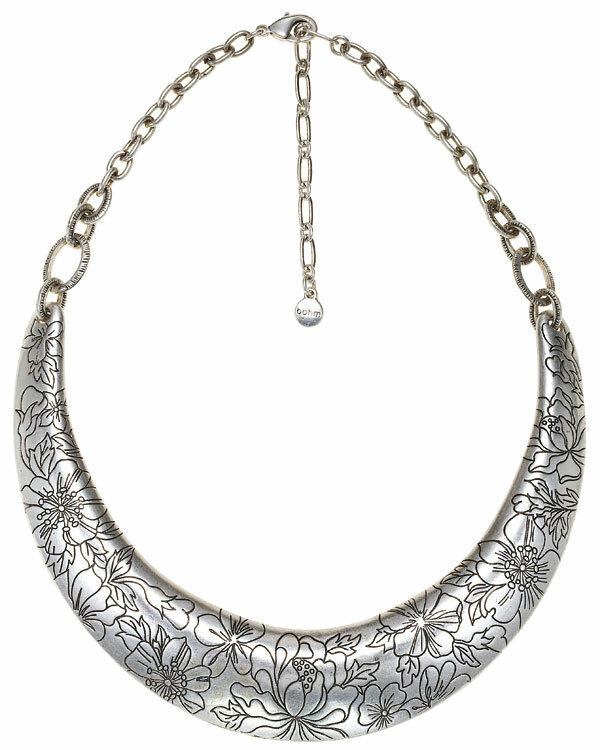 Simple yet stunning floral impressed crescent shaped collar. The widest part is 3cm/30mm. The clasp fits through all the links so you can adjust it from less than 14 inches/36cm upto 20 inches/51cm. 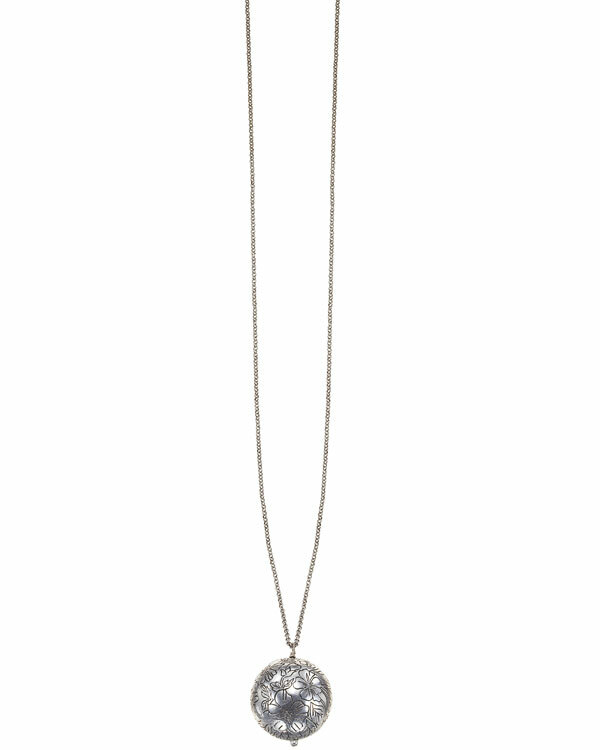 Simple yet stunning heavy sphere pendant (3.5cm/35mm) with impressed floral design. Long length chain 36 inches/92cm. Silver plate. Simple yet stunning heavy floral impressed sphere pendant with a stack of rounded beads above (natural turquoise, crystal and glass). The largest bead measures 2.75cm/275mm, length of pendant 7cm/70mm. Long length chain 35 inches/89cm. Silver plate/turquoise/brown/green/yellow. Simple yet stunning heavy floral impressed sphere pendant with a stack of rounded beads above (natural turquoise, crystal and glass). The largest bead measures 2.75cm/275mm, length of pendant 7cm/70mm. Long length chain 35 inches/89cm. Silver plate/red/turquoise/peach/green. 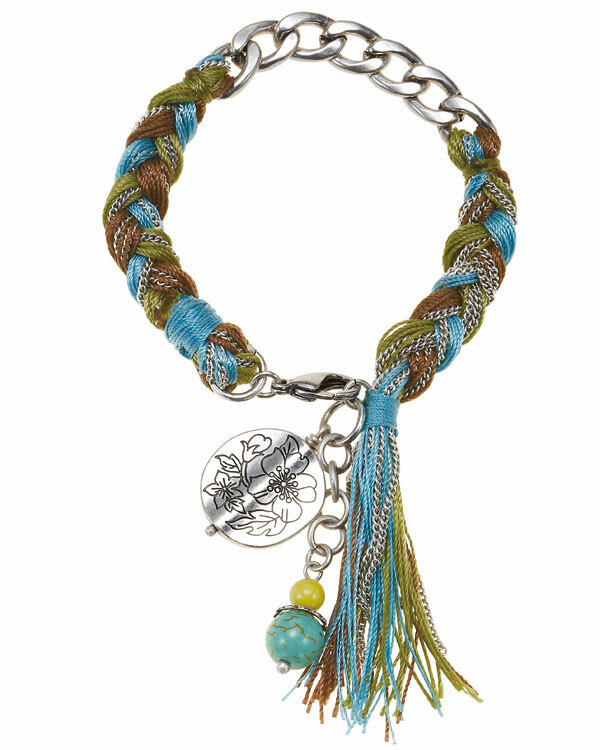 Gorgeous woven design bracelet with chain elements. 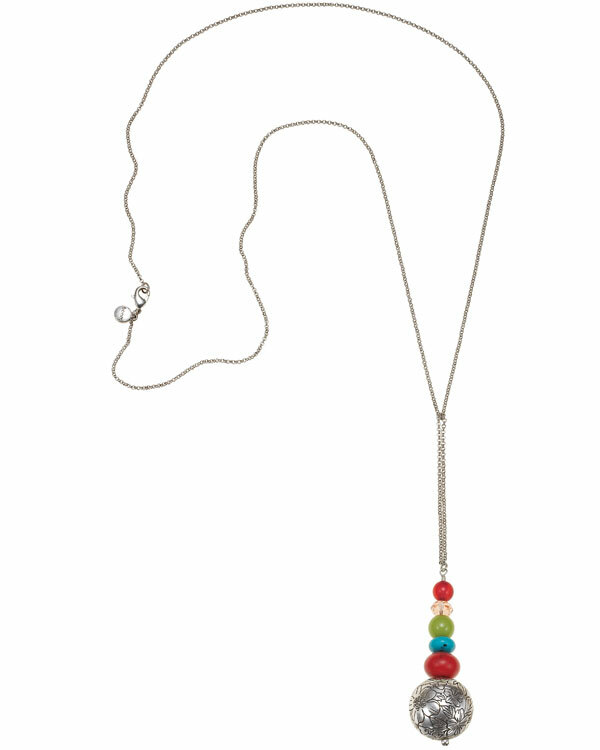 The decorative focus comprises a tassel, bead charm (natural turquoise and red bead) and silver floral impressed disc charm. The largest charm measures 2cm/20mm. Length 7 inches/18cm to a adjustable 9 inches/23cm. Silver plate/turquoise/coral pink/lime green. 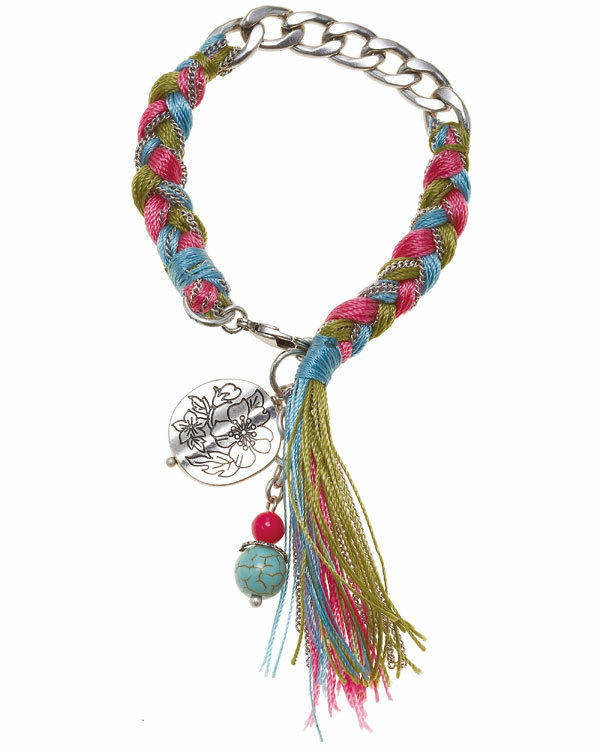 Gorgeous woven design bracelet with chain elements. 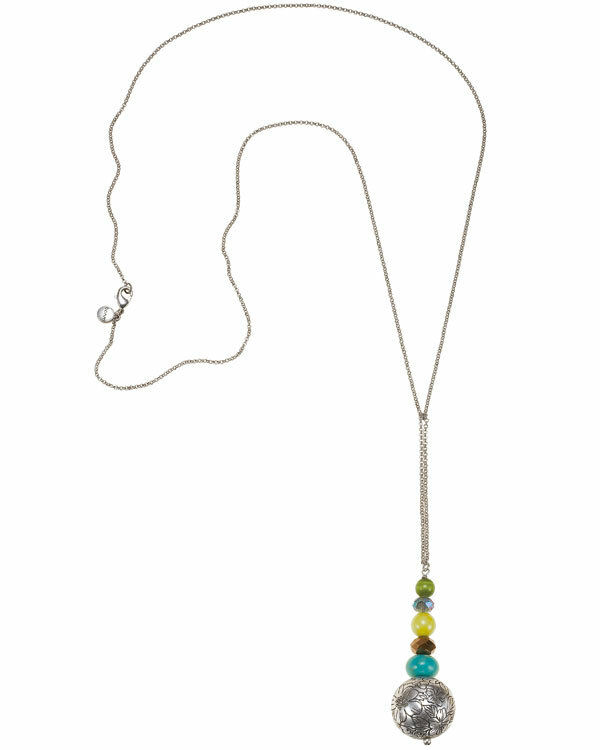 The decorative focus comprises a tassel, bead charm (natural turquoise and lime green bead) and silver floral impressed disc charm. The largest charm measures 2cm/20mm. Length 7 inches/18cm to a adjustable 9 inches/23cm. Silver plate/turquoise/brown/green. 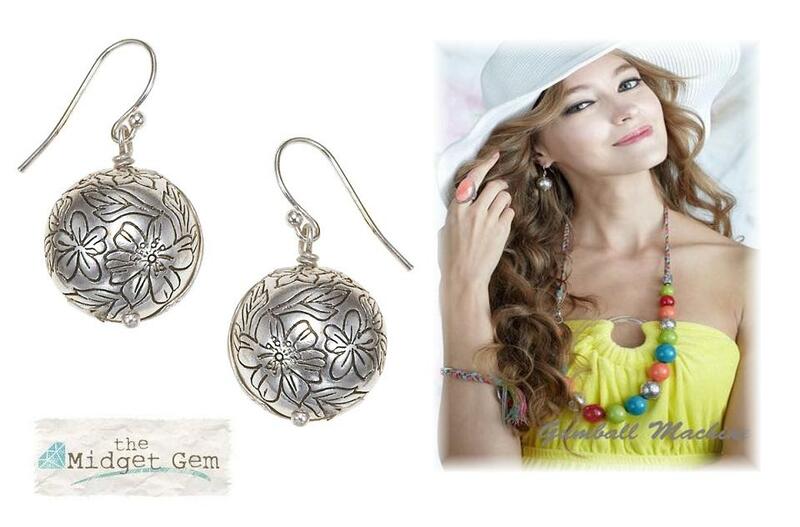 Simple yet stunning floral impressed flat disc dangly earrings. The discs measure 2cm/20mm. Total length 3.5cm/35mm. Hook style for pierced ears. Silver plate. 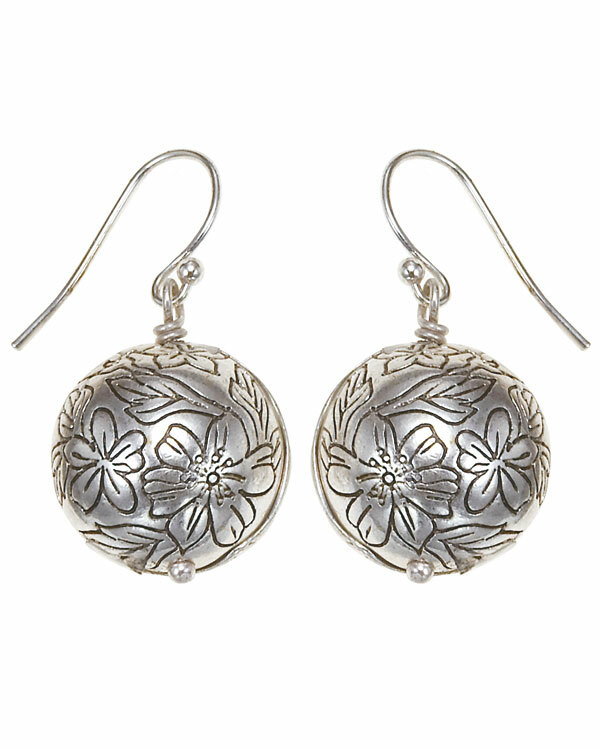 Simple yet stunning floral impressed ball dangly earrings. The spheres measure 1.5cm/15mm. Total length 3cm/30mm. Hook style for pierced ears. Silver plate. 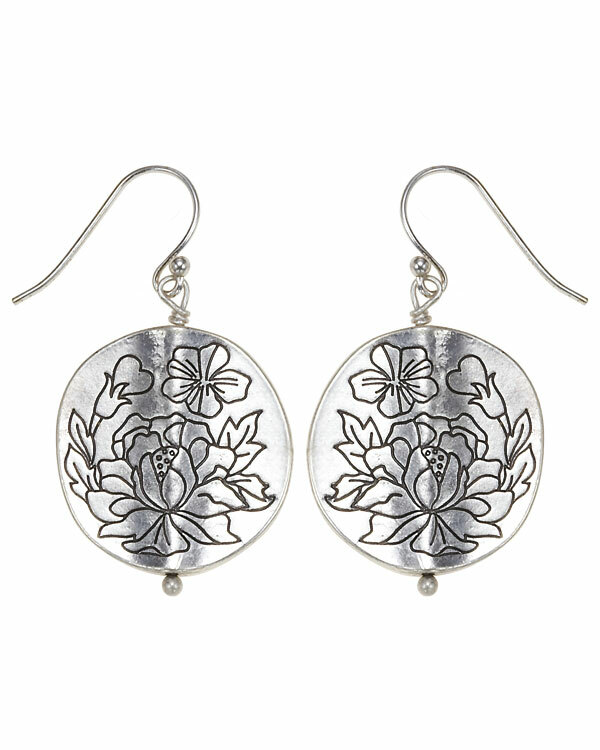 Simple yet stunning floral impressed hoop style earrings. 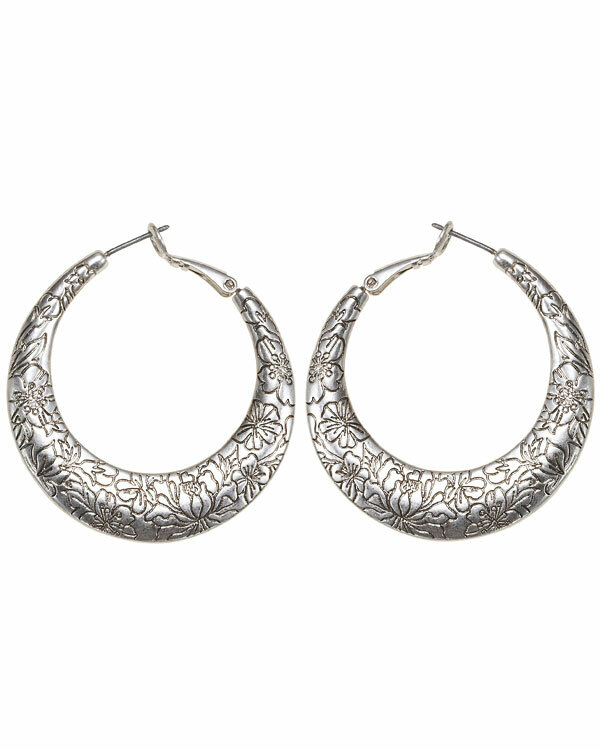 The hoops are hollow and decorated on both sides. Beautiful quality. They measure 4cm/40mm. French clip fastener for pierced ears. Silver plate. 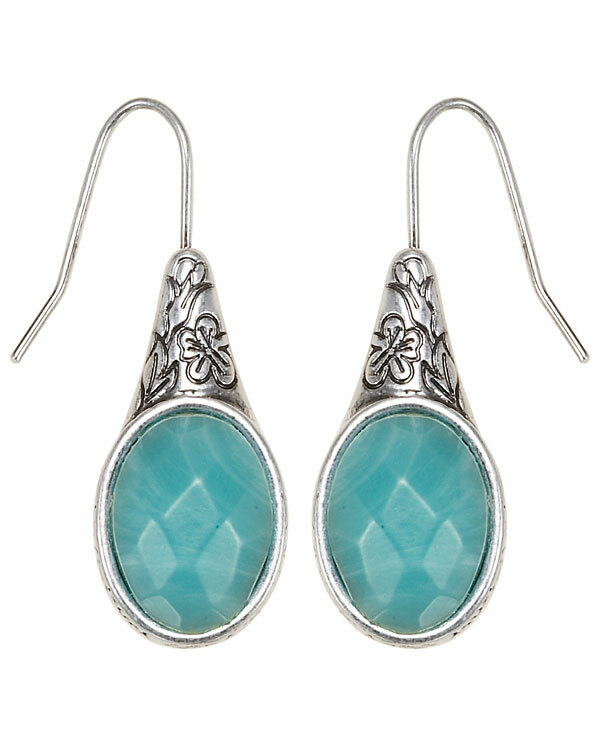 Very pretty floral impressed drop style dangly earrings with a semi-precious faceted stone insert (turquoise). The drops measure 3.5cm/35mm in total length. Hook style for pierced ears. Silver plate/turquoise.